We finally made that one trip to Malaysia! It is a fantastic country with lots to sample food wise, and we’d love to share some of those things with you. We truly hope you enjoy them. 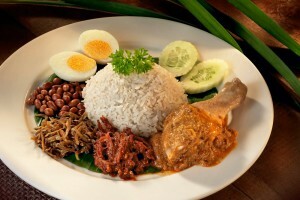 There is nothing better than the Nasi Lemak. It’s a fantastically tasty dish, consisting of rice steamed santan and coconut milk (giving it fantastic fragrance, throwing in fish or chicken curry, as well as all the other extra side dishes such as fried anchovies, hard boiled eggs and cucumbers. I highly recommend eating this dish whenever you are in town! There are a couple of moderately famous places in and around Kuala Lumpur – but I think the best Nasi Lemak (literally translated into fatty rice by the way) are the ones you get from the stalls in and around the city. Try it the next time you get the chance! Fried rice noodles are delicious. This is literally a plate of thick yellow noodles, with all sorts of ingredients in it – boiled with thick dark sauce, pork, squid and cakes. People tend to put all sorts of stuff in it as well, such as vegetables. Pork lard is usually the main ingredient. You can eat fried rice noodles at anytime and at any place. Highly recommended. The name of this particular dish, literally translates into meaty bone tea. It is literally just soup, simmered in herbs and spices for a couple of hours, sometimes days for more taste. Other ingredients include mushrooms, vegetables and tofu. Sometimes, people enjoy the dried version, but in my opinion there is nothing better than the wet soupy feeling of sipping on your Bak Kut Teh. People usually have it for breakfast, but there are many occasions when you get BKT. Klang is by far the best place to get it, and the experience is a strange one. You get to this particular store, and the butchers are slicing up the pig nearby! This is weird, and in preparation for the next day’s meal (after all, you need to let the food stew a while right?) you sit and eat the soup not too far away. Sounds good? Tomorrow we’ll be talking about our food trip to Singapore! Sunday, October 11th, 201511:00 amThis entry was posted on at and is filed under Food Blog. You can follow any responses to this entry through the RSS 2.0 feed. Both comments and pings are currently closed.